In additional to commonly used FC (fluorocarbon) coatings, AES has developed both hydrophobic and hydrophilic molecular layer capillary coatings for our proprietary imaging cartridges to better suit your needs. PA coated capillaries contain proprietary bonds and cross linked layers of polyacrylamide. This coating eliminates electroosmotic flow (EOF) and minimizes hydrophobic interaction between samples and the wall of capillary. PA coating is stable over a broad pH range, from pH 2.5 to 10.5. Because the silica surface is covered with hydrophilic polyacrylamide, no dynamic coating additives such as methyl celluloses are necessary for high resolution protein iCIEF separation. Therefore, PA coated capillary imaging cartridges are especially recommended for complex or hydrophobic protein iCIEF, preparative iCIEF, and direct coupling to MS.
FC or DB (dimethylsiloxane) coated capillaries contain proprietary bonds and cross linked fluorocarbon or dimethylsiloxane. Imaging cartridges with these capillaries are hydrophobic, chemically inert, and stable from pH 2.5-11.0. 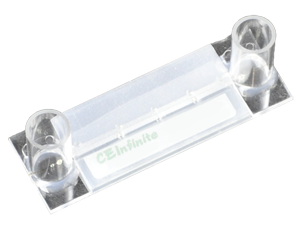 These cartridges are recommended for routine iCIEF proteins, as FC coated capillary typically last longer at broad pH range applications.